I tried the "G30 A" on a 40mm bed (more than that, rods are disconnecting) until I get the new part. I runned for 17 time until I stopped it. Does it run until all parameter are staying the same? Since my rods are not stable, that might cause some issue, but I was just wondering! Edited 2 time(s). Last edit at 08/01/2014 11:35PM by nka. Oh so that's normal. I guess the software is trying to get the same result as the last test before calling it "Done". Can wait to try again with the new setup. It was doing 2 tap on the middle, and 2-3 elsewhere, except at one spot, was keep doing 7 taps, but at the place the effector isn't leveled at all, almost disconnected. i had the problem with much tapping too. in my case i set m y x y z steps per mm from 80 to 80.2 after that the auto leveling was tapping 10-15 times till the piont was stored. with 80steps/mm the problem was solved. Realy love your job on this printer! I'm currently working on making one but i'm not gonna use magnetic arm , i have some traxxas Rod end and some carbon tube to make my arm. My problem is that i'm not really good for designing a part and i wanted to know if there is a chance to see a version of your effector with traxxas ball joint fixation like the kossel mini effector (same space beetwen the rods). Last night, I had *another* spherical magnet break free of the CA glue on my effector plate mid-print! My printer uses 1/2 inch (12.7mm) spherical magnets, and I used my ball end mill to ream the cups on the effector plate before gluing the magnets. Instead of using more CA this time, I put a dab of ABS juice (acetone and ABS filament) into the socket and clamped the sphere overnight. It has held up to 15 minutes of printing so far...but then two *different* magnets let go...one of them on a carriage this time. I am starting to question my sanity here. My first printer (Delta RepStrap) used an M5 SHCS with the spherical magnet attached with CA as the attachment mechanism. It printed over a spool of filament without losing a magnet, and ultimately failed because the effector plate was printed in PLA and it melted down several times printing ABS to the point where it was fatigued and rubbery even at room temperature. I printed enough Cherry Pi parts to make a replacement printer, but used an early CP-I effector plate and Johann's continuous ball sliders (that did not work well for me) because they were printed before the first printer failed. Those parts held up enough to print three new complete V-roller CP-III carriages, a new CP-III effector plate, and about 1/2 spool of other stuff without incident. In the past week, it has not been able to run more than 1/2 hour without throwing a magnet for some reason. you should look some post above, there's a new solution without magnet. Edited 1 time(s). Last edit at 08/03/2014 12:53PM by nka. I don't really have time to produce another effector design they take quite a while in Sketchup. Why don't you build my new 'magnetless' (is that a word? Lol) effector and go with that one. Or you could use your Traxas joints in a Kossel. It looks like a great machine. I'm pretty sure some one has published a 2020 version of it somewhere. Based on Andy's success having the ball attached to the rod instead of to the effector like I was trying to do, I may take the 1/2 inch Delrin balls that I purchased for my original testing and drill them out to insert my CF rods into and try it his way. I am still convinced that thin parachute shock cord will work for the spring. As FYI, I use Gorilla CA Glue. Work very nicely and I love the content. In fact, I also have wood glue and "normal?" glue from them. I always use high viscosity CA it's the consistency of maple syrup and stinks to high heaven but it sticks pretty good. Roughing up the plastic helps too. The ones that I have had fail seem to let go of the ABS first. I always clean the magnets in acetone before I glue them. If your doing the magnetless effector, seems that motherboard/harddrive screw work just fine into it ! Got the new "magnetless" effector installed. It seems pretty much more stable than the magnet (from "manual" mouvement). It's pretty much easy to build too. Just not sure about the balls milling (how did you do it Andy?). I hope I'll have time to test it soon ! I'm pretty sure I'm at only some hours from printing something. Hope calibration will be okay (It should, x-y-z are moving at exact distance after calibration and same for extruder). I'll test a 10x10 cube tonight if I can. Here's the link [www.ebay.co.uk] they are not a bad price at £8.25 (inc postage in the UK) for 50. As I'm building quite a few printers now having 38 spare wasn't a problem! Can't wait to see the 'first print'video. Calibration finished after 99 time. I guess it's not "normal". Everywhere, the printer tap 2-3 time, except for the middle point between x and y, she's always tapping 7 times (not sure for the last want, I wasnt there). I'll install my E3D soon, and I'll be able to recalibrate and test printing ! What is the best way to "tight" the belt? Edited 2 time(s). Last edit at 08/05/2014 09:49PM by nka. Looks great. Best way to tighten the belts is to loosen the screws on the steppers and lift them to the top of the slots. Pull the belt loop into the rod carriers as tight as you can get it and then screw a 10mm M3 SHCS into the 'loop' the belts will be fairly tight at this point. Push down on each stepper to fully tighten then tighten up the stepper mount screws. You will be able to 'twang' them now! If I'm lucky, I already have them on the "TOP", so I will be able to loose them and push them to the bottom! btw, you think my calibration look great? Isnt 99 the "maximum" of interation ? I finished my printer last night! I was trying to test out how to set the z-offset for home and kicked off the print just to see what it would do. The head went slightly too low (I must've forgotten to compensate for the tape), so it plowed right through the tape and kept on printing. I never expected the first print to be so successful! Very happy. Now I just have to figure out that auto-probe stuff. the print quality of my pi is not bad, but if i print larger pieces, the problem is that the nozzel still scrubs on the last layer. i have tested g30a but still the same. i think the problem is when the printer make a direction change, the nozzel lifts ca 0,1 mm up. i made a video [youtu.be] , what do you think could the reason for that? What are your delta segments set too? I´ve tested the segments per mm, parameter, but with no succsess. i played with acallaration and jerk, too, nothing better. At the moment i have no idea what the reason could be . i made a triangel to all three towers, i go to tower a, b to c and to x0y0 always ca 0.2 nozzel lift. But from x0y0 to tower c it is fine. i made one more video [youtu.be] . At the moment i would nothting rather doing than print with a perfect adjusted cherry pi, because i love the desing. i also made a test without the spring, same result. Are you sure the glass is actually flat a lot even mirrored is not. Also are all 6 arms exactly the same length ? Edited 1 time(s). Last edit at 08/09/2014 06:38PM by KtB. Yes I'm sure all arms are exactly same length, all are between +-0.05mm. Steep up and shellows during the move down to the same point of start. Only other thing i can think of it play in the belts. I have some belt tensioners on mine made from peg springs as i found it very hard to get the belts all tensioned the same. It should be fairly easy to get consistent belt tension. 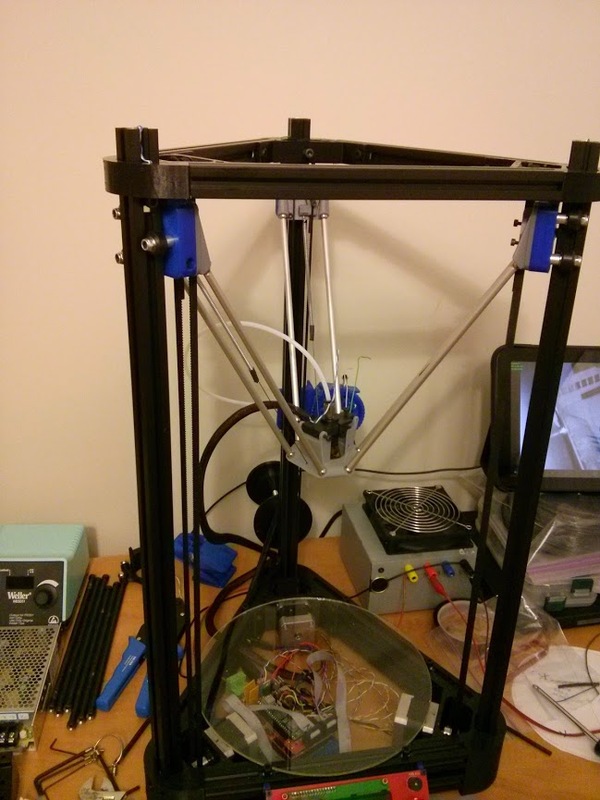 Just loosen the stepper mounting screws and push the motors down before you re tighten them. You could also move the top vertex up a bit but you would then have to re level the bed. I've built a lot of Cherry Pi machines now and it's never been an issue. The trick is to get them as tight as you can before you alter the stepper height. Hum, maybe this could be a idea, the to idler could be spring loaded to always give a tension. Andy, can you give a link to where you found the 8mm ball bearings with the 4mm hole? I'm having no luck finding them.